Discover new favorites in these pre-selected 6-, 12- and 24-jar combinations. 12-oz. jars. BESTSELLERS Variety Pack includes. . .
Berry Pack Variety Pack includes. . .
Marmalades & Conserves Variety Pack includes. . .
Jellies Variety Pack includes. . . Favorite Preserves Variety Pack includes. . . Favorite Jams & Jellies Variety Pack includes. . .
12 BESTSELLERS Variety Pack includes. . .
All Flavors Variety Pack includes. . . Please Note: Multiple Samplers going to the SAME ADDRESS... If you order more than one sampler going to the same address, we must package the jelly in 12-jar cases and not in the 6-jar molded pulp pictured above. Samplers intended as gifts will need to be separated and repackaged. 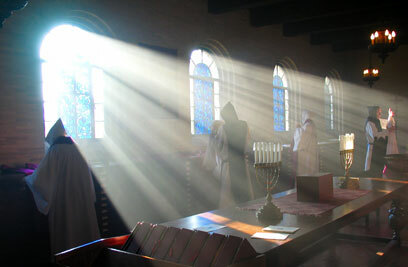 St. Joseph's Abbey is a monastery of the Catholic Order of Cistercians of the Strict Observance (O.C.S.O. 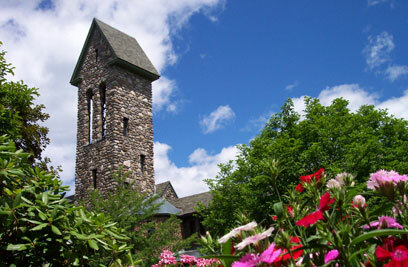 ), popularly known as the "Trappists", located in Spencer, Massachusetts. The Abbey was founded in 1950 by Belgian and French Trappist monks from the Monastery of Our Lady of the Valley in Valley Falls, Rhode Island, which had burned to the ground. In the rustic hills of central New England, they established a new home in which to follow an age-old contemplative way of life. The monastery became known internationally as the origin of the Centering Prayer movement, whose leading proponents were monks at the monastery: Fr. William Meninger, Fr. M. Basil Pennington and Fr. Thomas Keating. Work has always been greatly esteemed in the Cistercian tradition, since it gives the monks the opportunity to follow in Christ' footsteps and share in His Divine work of creation and restoration. The monks participate in three major industries which provide for their livelihood and for the care of the poor. 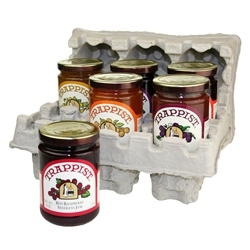 Since the 1950s, they have produced Trappist Preserves, their popular line of 30 flavors of jams and jellies. Since 1949, The Holy Rood Guild has created beautiful, finely-tailored liturgical vestments to enhance the dignity of the Sacred Liturgy. In 2014, with the advice and assistance of their brother Trappists in Belgium, the monks founded Spencer Brewery, producing the first and only certified Trappist beer made in the United States. Feb 22, 2019 | By CAROL R.
Delicious jams, jellies and preserves, great for gifts! This was purchased as a Christmas gift. It was delivered on time and enjoyed a lot by the family who received it! Dec 30, 2018 | By DEBORAH C.
I have wanted to try the preserves for a while. I should have tried them earlier, they are all delicious. Great flavors, great texture and the best part is my kids like them too. I will be buying more when these are finished. They will make great gifts as well. The boysenberry is incredible, I like the slightly tart flavor. I have used them on toast, English muffins and waffles so far. Truly a great tasting product. Oct 9, 2018 | By CINDY H.
I'm so glad I have been able to find real jams and jellies. Thank you! I will be ordering for my family as well. Oct 8, 2018 | By Samuel G.
AMAZING! Each and Every Flavor was a Delight! ...What was really MIND BLOWING is the fact that Each of the 'Wine' Flavored Varieties ACTUALLY TASTE LIKE WINE! OMG! AMAZING!! I was given a jar of the Ginger Preserve and then went on a Search to find where I could purchase more ---which is how I found this AMAZING 'Sampler', and it contains something for everyone's palate! The Burgundy Wine Jelly...REALLY TASTES LIKE BURGUNDY WINE! The same goes for the Port Wine Jelly and the Sherry Wine Jelly! The Quince, Red Currant & Elderberry Jellies are incredible! I LOVE marmalade and all reviews say the Trappist marmalade is the best, and they are so right. I can't help but eat it every day. This was a gift to the Order of Julian of Norwich.. They approve! Feb 14, 2018 | By Carol S.
All were excellent and well received! Jan 11, 2018 | By Robert W.
Our order was as a X-mas gift to our son-in-law's mother. She was very pleased with the gift. Thank you. Dec 29, 2017 | By Patricia R.
My friends and I always enjoy the preserves. They are the best. The best preserves on the market for years. Jan 11, 2017 | By Beth O. My order arrived as promised and in perfect condition. My father LOVES the preserves and jams! I have not found better jellies and preserves made in this country than the Trappist Monasteries' just-like-home-made preparations, no matter which ones I have tried. A fantastic selection of jams and marmalades. I'm delighted. Jul 26, 2016 | By JAMES L.
Best preserves and jams you can buy. Jan 29, 2016 | By Susan M.
A gift for my friend, who has enjoyed the quality. Jan 29, 2016 | By Robert M.
My wife and I love this selection. It was her Christmas gift, but I sneak it often on piece of toast or a cracker or best on cheese. Dec 29, 2015 | By Janet S.
Great value for the quantity of product received. Gift was well-received. Trappist jams/jellies are AWESOME! They are all great, but my personal favorites are strawberry and blueberry, each with big fat chunks of fruit. The quality is superior. These jams/jellies are a real treat, make an awesome gift pack for people that are hard to buy for. Nov 30, 2015 | By brenda a. All of the preserves and jams taste like homemade. Delicious on toast, biscuits, or with little yogurt. I purchased the first time to support the monastery. Will repurchase because of the quality. From morning toast to Ice Cream topping. We can't find enough ways to use them. Great product form a great source!